Today, I’m really happy to have Omar Zenhom back on the show. Now Omar is someone who I met at a private mastermind meeting led by John Corcoran and he was actually a guest on the show already back in episode 88 when we talked about his award winning podcast, the $100 MBA. But along with his podcast, he’s been working on another project, Webinar Ninja, which is a software company that he founded last year which is already doing 7 figures. How he put together his team. Steve: You are listening to the My Wife Quit her Job Podcast, the place where I bring on successful bootstrapped business owners and delve deeply into what strategies are working and what strategies are not with their businesses. I’m Steve Chou and today we are talking with my buddy Omar Zenhom the founder of webinarninja.com. Now in this episode you’ll learn the keys to running a successful SaaS business, and best practices for an online webinar. Now before we begin I want to give a shout out to sitelock.com for being a sponsor of the show. If you owned a brick and mortar business you would secure it, right? Alarms, cameras, the whole deal. As an online business you may not think about security as much, but you should because your customers are. And did you know that one third of consumers hesitate to purchase online due to security concerns? Protect your business and your customers with site lock website security, offering malware scanning and removal and industry leading web application firewall and more, SiteLock acts as your personal security team. So visit sitelock.com/mywifequitherjob for more information and get your first three months free. Once again that’s sitelock.com/mywifequitherjob. And if you want to learn how to start your own online business, be sure to sign up for my free six day mini course where I show you how my wife and I managed to make over 100K in profit in our first year of business. So go to mywifequitherjob.com, sign up right there on the front page and I’ll send you the mini course right away via email. Now onto the show. Steve: Welcome to the My Wife Quit Her Job Podcast. Today I’m happy to have my buddy Omar Zenhom back on the show. Now Omar is someone who I met at a mastermind SF long ago, and he was actually a guest on the show already back in the episode 88, where we talked about his award winning podcast $100 MBA. But even back then Omar had a SaaS project brewing in the background called WebinarNinja. I think he launched it in 2005, correct if me if I’m wrong Omar. But he is already gone out to become one of the best webinar software packages out there and generates seven figures per year. Now WebinarNinja stands out to me because it was completely bootstrapped. And what’s also cool is that Omar works together with his wife Nicole to run the business. Now as I have mentioned in the past starting a SaaS company is on my list of to do’s. And so with that welcome to the show Omar, how is it going man, how are you doing today? Omar: I’m doing well man; I always get time for my [inaudible 00:02:51]. Steve: So did I get that right, did you guys start in 2015? Omar: We actually started in 14; it was still in beta back then. We were just seeing if there was a market for it, really we were just – and we opened it up for a launch a couple of times for like a hundred users at a time. And when we sold out we realized okay maybe this is a viable idea. We officially kind of went browser based, and were more of a competitor in 2015. Steve: Yeah I remember. I think I first interviewed you, you guys were still doing betas, like you had just released like a paid product or something at that point? Steve: So how did you come up with a webinar software, because off the top of my head I can think of maybe six or seven just off the top of my head. Isn’t this like a super competitive area to be in? Omar: It’s very competitive yeah. Well I kind of was a early adopter of webinars. I really loved webinars, because for those who know me a bit I was a teacher and educator for over 13 years at the high school and university level. And for me it was just a great medium for me to teach for my audience to give workshops, to do Q&A. I just thought it was a great like technology, this is a great idea. I started doing them for our community at the $100 MBA and just to support our members, but it was also like almost not sure that it was worth because it was so clunky. The software that was out there or you had to like hodge podge yourself with like plug-in this video thing here, and then you have a separate chat area, then you go create your own landing pages. And then you have to create an email auto responder, and like they all have to work together and they are not really meant to work together. And it just didn’t seem holistic. And then a couple of other software started to creep up. I didn’t like what was out there in terms of one either it was two for lack of a better term scummy looking. Like it was just not — it just looked like you just wanted to — it was all about like marketing and pushing and selling hard. And I know that marketing and sales is a big part of business, but the reason why webinars work is because they are there to build trust with your audience, for you to teach and to earn trust and build rapport, that should be at the forefront of the software. Or it was just expensive, or you had to download software, it was just kind of still not there. Still it was like there is a lot of areas of innovation that can happen in there. So I purely just created a small version, a beta version for myself so I don’t have to dodge punches. So I don’t have to deal with all these moving parts or use any of these other like softwares that were currently out there. And I just started doing webinars with it and my audience members who were on the webinar were like hey what are you using for this? I was like oh it’s just something I put together. I knew a little bit of PHP, HTML. I got a coder to clean it up for me like a freelancer, it wasn’t even a fulltime hire. And then they asked me, hey can I buy this? I was like oh I guess so. And like give me a few minutes to put up a sales page. Steve: Wait so you coded the first version, I didn’t know that? Omar: Yeah it was primitive, it was very small. And it was probably really like poorly coded I mean. But I had somebody clean it up for me in terms of — they had some bugs and I had to really read it out. But I kind of was self taught, I self taught myself PHP. I knew a bit of HTML, CSS just from design websites for clients and things like that. But yeah so that was a lot of fun but I’m known — I wouldn’t consider myself a developer. In fact I’m challenging myself in the next couple of months to learn or master ruby on rails. It’s just something that I always wanted to do just kind of really feel like I know what I’m doing, and work my way around the code. But I always been a kind of person that like hey I’ll give it a try and I’ll get some help if I need some help. There is experts around me I don’t need to be expert at everything. And then some people just said hey I want to buy it. So I just talked to Nicole my business partner and my wife. I said hey what do you think about this? And she is like let’s give it a try. So we just kind of packaged it up, and we only opened it to beta members and just a hundred members, we said we are going to see if they sell. If it doesn’t sell then forget it. And we sold out in 24 hours, so we were like okay great. Omar: Yes so we were like okay there is a response, we opened it up again a few months later for another 100 and sold out. So then we were like okay we need to really think about this is a viable business. How much time, how much money are we going to invest into making this what it really needs to be really? And that’s kind of how the ball started rolling. Steve: So a couple of questions for you. You said something interesting that you were trying to learn ruby on rails, but yet you are still trying to run this company. And for me at least my listeners and my readers have often criticized me for wanting to do all the technical stuff and run the businesses as well. So how do you kind of like balance the time for that? Omar: Well first of all I’m not learning it so I can code my own software. The project now is way beyond my scope, like I would need a few years. Because it’s not just coding, it’s design, and there is all these different types of — I don’t know server administration, I don’t know SQL, I don’t know PHP, I don’t know Node.js, I don’t know web RTC. There are so many things that go into the software that I need somebody who is — I need people, not somebody lots of people to be experts at it. But I’m learning it so I can understand the thinking process of developers; understand the logic behind so I can communicate more effectively with them. Steve: That makes sense yeah. Omar: And I also think in a way it’s like learning a new language. It’s like learning Mandarin or learning Arabic or whatever it is. Something that’s completely foreign to me and I’m just jumping in, and I’m just challenging myself to be a learner again. Steve: I think since I was the tech industry before like I know firsthand it always helps to have someone who understands the tech aspects when they are planning the project, because they know what’s realistic and what is not. So just curious how much did it cost you to start this business? Omar: Well I never actually — I don’t believe in like dipping into savings or kind of getting funding or something like that when I start a business. I really think that you should get the money first, and I pre-sold it. I didn’t actually use it — I pre-sold those 100 beta members — they didn’t have any access to it. And the next 100 didn’t have access either. We were still like — they had like limited access some of them just tried it out to give us feedback. But they didn’t have like full access to the software, there was a launch day and they knew what they were getting. Those very lucky numbers have lifetime memberships. So they basically formed webinar ninjas today. So I actually got the money first and funded it that way. And I grew my team slowly. When you have a user base of under 500, you can do customer service yourself. You can do — or you can get one person. You can — you may need software like I didn’t use [inaudible 00:10:31] I just used Gmail with a business email which costs $2 a month. Steve: Interesting, okay. So what was your value proposition just curious, because there were a bunch of other options out there at the time, right? Omar: You’re right, so I wanted to make it a lot easier for people to create webinars faster, simpler. And I also like one of our core values is one to be easy and simple, but also two for them to focus on the content and not worry about the technology. Too much is going on, on other webinar softwares. There is too much things to worry about, do I have to record, do I have to do this? Where is my chart, how do I go back to that screen? If it’s too confusing it should be intuitive, it should be easier follow. So that way you can just focus on your slides or whatever you are talking about on camera answering questions. So that was kind of our main focus to really make learning — like learning central. So and on top of that I wanted to make sure that it’s all inclusive, meaning if you notice a lot of webinar softwares out there, they only offer live webinars, or they have a completely separate software for every webinar. So they have something else that’s just for anytime webinar. So I just thought that was foolish. I just thought that hey like I want to solve all the problems. I want to be able to say hey you want to run live or evergreen or whatever in one package and I’m not going to up sale you, and I’m not going to charge you more for that. So we wanted to kind of just be all inclusive solution. So ease of use, interactivity, and making sure learning is the priority as well as making sure it’s an all inclusive package. Steve: Is the email portion of that included as well? Omar: Yeah all our email notifications and reminders are included. We send those out on your behalf. You also can broadcast emails, so like if you want to send out emails that follow after like create new emails like after the webinar or before the webinar. As long as they are on your — they’ve reached it for the webinar, you can email them. Steve: Okay and you mentioned that you coded the first version, how did you actually find your first engineers to help you develop this? Like where did you find them, and what were kind of like the terms of having them on the project? Omar: I basically went on freelancer.com which I was familiar with, because I used to be a freelancer as just a web designer. I used to do like WordPress sites, things like that. So I just looked for a PHP developer that had some experience with creating apps, and I just said hey, I just interviewed him on Skype. I have to say like my first hire wasn’t the best hire. We didn’t work out a couple of weeks after into the project, I had to fire him. I took a couple of hires and then I found somebody that can help me out. But I realized that okay this person’s their knowledge or expertise only can take me so far, I need to up my game. And I need to get a better developer that can have a wider scope of what we are doing especially when we went browser based. And then I continue to do that now even today like we have to improve our team all the time, like I want to push the envelope constantly. So we just hired new developers to join our team and we just hired new DX designer. So it’s just always trying to figure out like when I’m I going to hit that ceiling with the talent I have, and I need to get more talent, I get to get better talent. One of the things I love to do is I love to read books. I love to read biographies of great entrepreneurs. Obviously one of my favorites is Elon Musk, and that’s one thing I really took out of his book is that he just really invested in his team. He got the best people whether it’s SpaceX or Tesla or SolarCity, he really invested in getting the best talent to get the best product. Steve: So for your first hire though that didn’t work out, are you still getting your talent from the same place? Steve: How did you kind of refine your engineering? Yeah so where do you get it now, or where have you gotten your best hires from? Omar: So it depends on the hire. So if it’s development I use a service called Toptal, they are actually sponsor of our podcasts, and so full disclosure, but that’s kind of how I found out about them, they approached us, they said, hey, we would love to be a sponsor in your show. I said what is this? It’s like; oh we’ve had the best developers and designers. I was like, okay cool I’m looking to hire. And they said hey — we worked out a dealer, I was like, hey I want to use you so I can have a better read on my show. So I want to be able to hire somebody and talk about my experience. So when it comes to yeah designers and developers I use Toptal. Before that I used Upwork, I used Hired, I used Freelancer. I have used all these different sites and some of them are more successful than others. If it’s customer service you have, it’s a lot of work to just find somebody with good communication skills, technical skills, but right now I would say half the hires we have come from referrals. A lot of times we give incentives, we give bonuses for those who make a referral, and if that person is a great hire, and they pass the probation period which is 3 months, then the person who referred them would get a bonus, a cash bonus. It’s a good way to get somebody that will understand the culture of our business and our expectations, our level of communication, what we expect from them, things like that. Steve: For your early hires at least did you provide an equity state to keep them motivated, like how do you keep them motivated for just your company? Omar: I have never offered equity till this day. Omar: I’ve been approached a few times in terms of investors and I’ve turned them down just because I want be as boot strapped, I want to continue to be boot strapped as long as I can. As long as I’m profitable, as long as I’m able to grow the team the way I want to, and if I can keep in control of them, like I can still have control, full control, then I’m going to remain that way. That’s a good question about motivation; we do a lot of different things with our staff, with our team to motivate them beyond monetary reasons. It’s just a fun place to be in terms of like, it’s all remote, but we also support each other with our slack channels, we help each other out. You know praise is a huge thing, making sure people feel valued, giving a project that challenge them, they can feel that they are working towards a certain goal, promotions, things like that, work experience. Most people are not used to that, most people are used to just being told what to do, and in some way they have feel they have equity at least in terms of, and a creation or in terms of contribution to the project. Steve: Interesting, okay, and so everyone is completely remote, like you don’t have a physical office, right? Omar: No our whole team is remote. Steve: Okay, so can we talk about those early beta users for a little bit, like how did you get those guys? Omar: Well I had an existing audience with $100 MBA program as well as we were growing an audience with our podcast. I put out some fillers, I threw out an email, you know I did the whole thing where I talked about it with blog posts, I did some guest posting as well in other blogs talking about what I learned through doing X amount of webinars, hundreds of webinars, and what I’m trying to do to improve the weather and our experience with our software. I tried to get it on as many podcasts or video shows as I could, and I thought if I could just give value, show people how to do well with webinars, how to win with webinars regardless of what software they use. This is something I do on regular basis with our webinars; I do on WebinarNinja 4, the software. I do give offers with the software on the webinar, but I try to give as much value, like there is a lot of people out there talking about, “You can make all this money with webinars.” That’s true, you can make out money, and we have users like Johnny Dumas who’s made over 4 million dollars a year off webinar sales which is great, incredible, but the point here is that he hasn’t have a success because he’s some sort of charismatic person. He has a formula, he has presentation skills, he crafts a great presentation. One of the things I did at the start to try to get as many users is to become an authority when it comes to how to actually craft a great webinar, how to put together a great presentation, how to interact with the audience, how to have on camera presence. These are things no one was talking about. People were just talking about, “Use this tactic, or use red buttons or whatever.” That doesn’t really — you know the funny thing is that like what makes a great podcast, or what makes a great show or makes a great blog is the content. So if you can deliver great content, and I say deliver great content, it’s not only the content that’s important, but the delivery is important as well, like you can’t be a snooze fest, and those webinars that are engaging and exciting, they are engaging and exciting for a reason, they were designed that way, and you can do it too. Steve: So the webinars that you were running prior to WebinarNinja, were they about webinars or were they about some different topic? Omar: It was a different topic, a business topic, but as I started to develop WebinarNinja, I started to think, you know half of the equation is the technical aspects of webinars, like people don’t do webinars because they don’t really fully understand how to use the technology. The other half is I don’t know what to do on this webinar, what I’m I supposed to teach, how I’m I supposed to present. How do I make sure that people actually stay on, and they come back for the next webinar or tell other people? I wanted to have relief all that anxiety, I have control over that, I have a lot of expertise to that, I’m a trained teacher, I should be able to do this. That’s what I was trying to do with WebinarNinja is try to supply that training as well as supply the tools so that I allow that to happen. Steve: Would you say that your best customer acquisition channels have been webinars themselves to your customers? Omar: Yes, I would say so, yeah definitely. I would put that out there along with the content that we give, like we have a free course on WebinarNinja on how to plan a launcher for webinar which in some way it’s what we teach in one hour, but this is a little bit more in depth. We go from A to Z about the technical aspects to the hardware you need to how to actually sell, how to market, how to make sure that you have attendees, all that kind of stuff. Steve: How do you get people to sign up for that? Omar: Sign up for the actual webinar or the course? Steve: The course, like how do you get traffic to the sign up page? Omar: We do a variety of things, so one we actually have a little mini podcast on webinars called WebinarNinja that we started when we actually launched WebinarNinja talking about the creation of the software. We got experts, it’s a narrative type of podcast that we weave in interviews in, and that generated a lot of leads to the website. I again did a lot of guest posting on different websites, talking about how to utilize webinars, but we also used paid advertizing, we used a lot of Facebook ads, and I had a bumpy start with Facebook ads at the start. I realized quickly that I need somebody who really knows what they are doing. I started to try to figure out myself. There is a lot of things that are involved in Facebook ads, not only getting the right audience, and targeting the right audience, and also like pitching the right copy and all that stuff, but there is also the graphics, there is also the whole process of getting them to convert, so I started to hire an expert to help me out, which again a great expert helped me out, started to get us leads, wanted to take it to the next level, found somebody who is just a little bit better at it than now I’m on my 3rd hire. Not that the other 2 hires were bad, I just hit my cap with them, and now I am more where I need to be in terms of the level of marketing and our money that we are using on Facebook ads. Steve: In terms of your best converting Facebook ad, what does that look like, what is the ad and the landing page look like? Omar: Well we have a lot of them, we have a whole bunch of them, but I really believe in trying to have a long term vision with things, and try to build rapport and trust. Most of our ads go straight to the course, or we talk about something in particular about the course. The more specific the ad, the better, like what are they actually going to get out of this course, like get a template on how to create your workshop, that’s a very clear understanding of what I’m going to get, what am I going to get out of this course? And that goes into the course of course, and then they consume the course, they may sign up after the course. They get follow up emails, they may not, but then I invite them to a live webinar of that course. At the webinar I will teach a topic whether that’s how to grow your audience with webinars, or how to increase sales, or how to grow your business or whatever it is, and at the end of the webinar I will give an offer. Even if they don’t sign up for the offer I continue to give them great content whether that’s blog posts or tips or research we found from our own company, like we do a lot of research on when the best time is to run a webinar based on our users, you know we extract that information depending on what country, and all that stuff and region. We try to support them as much as possible, but you have a better conversion rate when you have that several steps along the way rather than straight to a webinar, straight to an offer. With just a couple of clicks of the mouse you can add a referral program to your e-commerce store, and reward your customers for telling their friends about your shop, and this tactic works wonders. In fact it is not uncommon to get a ridiculous return on investment. I was going to ask you actually what is considered like a good cost per acquisition for you guys, for Facebook ads? Omar: That’s a tough question because Facebook is slowly and slowly getting more expensive, [inaudible 00:26:35] slowly slowing it down. It wasn’t, it’s not as cheap as it used to be, the short term of it or the sure way of saying that. You know for us we have different plans of starting from $45 a month, we have different offers, things like that. So for us as long as we can get a user for under that amount it’s a win, because that’s, it’s recurring revenue, and all our plans come with free trials, so they have 14 days to try it out before they’re even charged. For us it’s holding them on for that first 45 days, because you get the 14 days plus the month. Then for us we just know that if they give us a trial they will love it, and they will hang on, and we will have a long term process. Steve: I’m just how you can track like the Facebook ad if it’s such a long term funnel sometimes, in attribute to the ad, and like how much you are willing to pay like for one of those Facebook leads going to the course. Omar: Well, we track it with; you know we actually have tracking code on each page of our check out pages to figure out if they are actually converting from the ad. That way we know how much the advertizing cost is costing us, versus how many paying customers are getting. That is relative depending on the campaign and things like that, but we are talking about roughly $15-20. Steve: Okay, you know since we are on the topic of acquisition, recently I saw an AppSumo deal where you guys were giving away lifetime memberships to the basic plan for a pretty low fee, and I want to talk about this promotion because it seemed a little counter intuited to me, and I want to know the rationale behind it. I crunched the numbers, I went back, I took a look at our analytics, and the thing is, is that I realized that with our start up plan you have up to 100 attendees, live attendees, you have unlimited evergreen or replays or unlimited registrants, but you can have up to 100 people show up live. I looked at those users, and looked at how many webinars they actually create, I talk about, and I realized that that cycle of being a starter doesn’t last too long because once you get some sort of traction and success with webinars you are going to surpass 100 users pretty quickly. It doesn’t matter from the users end, because they we getting an ROI. They are making money off the sales or making on the webinar, so for them it is a great deal for them to continue to do webinars and pay for our software which is a fraction of the price that they are making on sales. One of the things that is interesting about our software or our business model is that the more webinars that are done, the more viral marketing happens. So every time you attend a webinar and you see that it’s been run on WebinarNinja that’s just another signal that WebinarNinja is a competitor there. That’s a choice, that’s an option for you if you ever want to run webinars, or if you are currently running webinars and you are not happy with your solution. So there is a lot of SEO benefits of running webinars. Steve: Really, holy crap okay. Omar: So for us that was a great win. And also it was just also a chance for us to get people that are — that have been wanting to do webinars but haven’t. And I love taking on people that are – the first time they ever listened to a podcast and it was through our podcast. Those that never subscribed to a blog and they subscribed to a blog, those people are very loyal, because they feel like you’ve really influenced them in a strong way. So I love that kind of customer, so for us it was a great investment. Steve: So if I can just summarize what you said, the whole point in giving it away is to kind of get them pregnant with the tool. And the ones who are successful will tend to upgrade to a higher plan whereas the ones who don’t would probably fizzle out anyways, right? So there was like a win-win? Omar: Yeah, if you’re not using the software it is not really going to cost us much. It costs us obviously storage space and things like that, but really the big cost is when they run a live webinar, when they are using the video technology, the live broadcast. So if they are doing webinars, then they are going to start growing and passing 100 attendees is not too hard. A lot of people think that’s intimidating, but if you are you are making money and you are seeing an ROI, so for us it’s a win-win for both parties. Steve: So given what you just said, how do you actually encourage people to use the tool and kind of how do you reduce churn on your product? Omar: Well there is a few things that we try to do. We try to one, educate them on one, how to get started. A lot of people just don’t know how to get started, they’ve never thought about doing a webinar, they are not really sure what to do, so we do tutorials, we give them videos. We follow with email sequences, we do live webinars just Q&A with our members only. When we release new features we show them how to use it on our Q&A webinar where we just say hey we just released a new feature, LeadPages integration, you go to LeadPages, this is how you do it. And just being open for questions, I try to be on as many webinars as possible; live webinars to keep people engaged. And at the same time I also like to kind of share the business logic of it. A lot of people, they want to do webinars because they see their mentors doing it, but they don’t realize that you need to incorporate this in your marketing strategy. And I try to write articles or do videos on that topic, or share podcast episodes I do on that topic where it shows them, hey if you can invite people to webinars, X amount of people and X amount convert. That’s like being able to just turn on a tap and say I want sales, let me do a webinar. So if people don’t realize that, some of them they don’t understand like it’s actually that much of an equation. They just kind of feel like oh I’m supposed to be doing webinars because that’s what people are doing. Steve: I actually just started doing them last August, and they’ve been just an incredible revenue generator, it’s like ATM machine almost. It’s crazy but since we are on this topic also I know — since you run WebinarNinja you probably have a ton of statistics from all the people who use your tool. So I was just kind of curious, and I’m sure the listeners are curious too. Like some of these questions like what’s the best time of day to run a webinar, or what best day it is? Like what’s the average attendance rate and that sort of thing, can you provide some statistics? Omar: Yeah sure, it all depends on your geographical location. But North America the best time to run a webinar are Tuesdays through Thursdays so Tuesday, Wednesday, Thursday. Tuesday being the most attended day. And the time range is between noon and 3 PM. Steve: Interesting, okay Pacific Time or Eastern Time? Omar: It depends on — see if the attendee is Eastern then that’s the Eastern Time. So it depends on where they are located. So that time range, so even if you just do 1 o’clock that kind of covers pretty much the time zones in every area. I’ve run webinars at 4 PM PSC which is 7 PM EST, and you get a different crowd. You get people come back from work, it’s good to experiment, it’s good to try out. But in terms of just raw numbers that’s been the best time that we found, Tuesday from 12 to 3 in North America. Funny enough it’s different in Europe, they actually attend during the day, maybe at work or something. Like the numbers are completely different. It’s 10 o’clock in the morning to 12 noon is a sweet spot in Europe. So yeah so it depends. Steve: Oh 1 to 3 is technically work also, isn’t it? Omar: Yeah it is it’s true, but usually it’s like a lunch hour. Usually some people — I also think of people that are in existing businesses, or working from home. Usually you’ll do your work in the morning, like you do your production in the morning, and then in the afternoon you’ll have time at lunch or afterwards to attend a webinar. At least for me that’s what I would do. But it’s just interesting depending on the geographical location. You also have to remember that your global — I have to constantly remind myself that we have audience members in Australia, New Zealand, and all these different areas have opposite time zones and sometimes you have to have a webinar at 10 o’clock at night, so you can suit that audience. And you’ll be surprised a lot of those audiences are hungry because they are not served. Steve: Interesting, and then what would you say like the average attendance rate is across the board? Omar: It depends on how many webinars you’ve done. So your attendance rate is actually very much correlated to how many webinars you do. So if you’ve done between one to three webinars, like you’ve anywhere between one, three webinars your average attendance rate is 43 people, just not that high 43, right? But once you start doing more than three webinars, from three to 10 webinars, you start to have an average rate of about 89, so it doubles, right? So then after you’ve done a whole bunch like this is average. And a lot of people don’t do any marketing; they have low list well things like that. But once you’ve passed 10 webinars, then it starts to become exponential, once 10 webinars hits, then you are well past 150 and 160 attendees. We have a pretty large list and we regularly get 500 to 600 people on. And I do a webinar a week, so like there are plenty of times I miss and go to the next one. So and that’s with zero ad straight to the webinar, that’s just through content and just through emails to a list, we usually only invite people that are already in our network, or in our contact list. Steve: I guess what I meant was like what percentage of signups actually attend? Steve: Can we talk about that a little bit actually? Steve: Yeah that is incredible. Omar: And a lot of it is that portion where now I’m trying to — there is two sales processes. There is one where you are sending an email to get people to register. And once they are registered, now you need to make sure they attend. And this is the part where people drop the ball. So we have these templates that go out automatically that you can customize. They are about five reminders, so there’s the one that’s a confirmation email when you signup. Then there is one that says your webinar is tomorrow, your webinar is today, your webinar is an hour to go, your webinar is starting right now, right? So you can customize it and I really like to incentive people to show up to the webinar. And I do it in all different ways. So I’ll give something for free like a template or an eBook or a downloadable. Or I tell them there is going to be an incredible discount, I’m not offering to anybody else except those who are live. On the replay the offer is going to be different. So that could be one incentive to show up live. Two, I incentivize them by doing something funny or interesting or personal. Or I say, hey I’m going to showing a video when I was four year old when I was dancing to Michael Jackson; you are not going to be able to see it. You got to show up live, you are going to love it blah, blah, blah. Three like send me your questions right now, reply to this email, send me your questions and I’m going to answer them the first thing make sure your questions are answered right away. And a lot of people they just have questions and they want an answer. And it’s not about the products; it’s about your topic. And they want to know — they want to make sure their answer is going to be — their questions are going to be answered. I just try and incentivize them as much as possible. If I’m having a co-host on right, I tell them, hey I’m going to have Steve Chou on, on this webinar, we are going to do a webinar together, we are going to have a lot of fun. In fact I’m going to ask Steve three embarrassing questions, and I put them boom, boom, boom. Like a part of this is entertainment. People have to be incentivized to show up, and be like this is fun, this is different, this is interesting. So you have that portion of selling them to get on them on the webinar. But then when they are on the webinar you have to have a great webinar. You have a fun webinar that will keep them on. And keep long enough for you to be able to make them an offer at the end, right? Steve: Yes, so what are some of your tips to kind of encourage someone to stay all the way to the very end? Omar: One of the things I do and I have a lot of fun with this. I actually did this recently with a webinar I did with Jason Zuck. We were doing a webinar for our course, easy course, and at the start of the webinar, you know we talked, “Hey this is Jason, this is me.” We have a lot of fun, we joke around, and then we give the menu, like we say this is what we are going to cover in today’s webinar. No one has ever done that on a webinar, so there is like surprise, it’s intriguing, what the heck is this, like, “Don’t worry guys we will tell you when the work drops over and the selling start. That’s when we are going to start forcing you to buy something.’ People laugh, and it gets funny, because it’s like obviously we are not trying to force them to do anything. We are just trying to help them take whatever, or teaching to the next level and be able to do it in a structured manner. People are refreshed by the idea that you are just being honest with them, and you are just telling them how it’s going to be, and just selling from the start, “Hey there is something that I’m going to give you for sale.” To be honest with you people are actually with that because they are under the impression that they might buy something, they know that, people don’t hate shopping, people like to buy things, but they just don’t like to be sold. They don’t like to be like cajoled into it, and feel like they didn’t make that decision. Steve: What would you say is a good attrition rate from beginning to end? 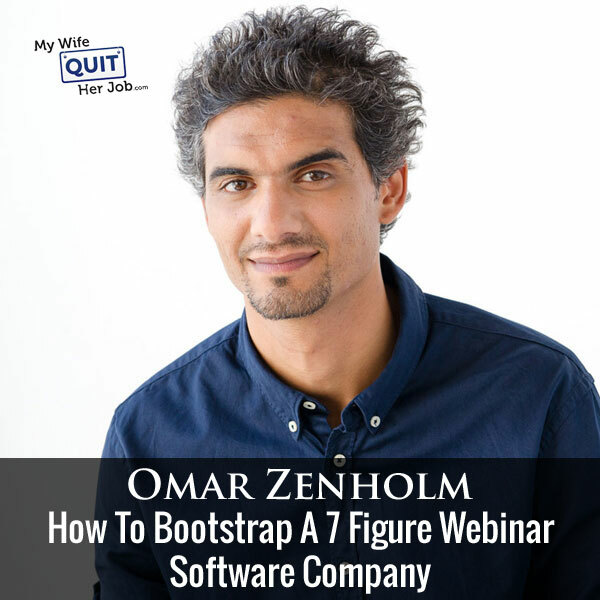 Omar: A lot of people show up late, a lot of people, lateness is a problem on webinars because there is nobody taking roll, but I would probably say if you can keep it up to about 60-70% that would be very good, but don’t be so hard on yourself, if you are first getting started. Just focus on the value, and focus on making sure that they feel like they got something out of the webinar. I just become something in their head, a memory, a thing to remember, so whenever they do want to do a webinar, so whatever I’m selling on the webinar they come back to me, they are not going to shop around, so that’s really what I’m trying to do. Steve: Actually what I found with my webinar is that sometimes it takes like 2 or 3 attendances of the same webinar for them to buy, do you find that happens to you with yours? Omar: Yeah, definitely, I think a lot of the times is, I learnt a lot of different things in terms of how to handle questions, because a lot of people they have questions, and some people, a lot of people do Q&A at the end. I actually try to do Q&A periodically throughout the webinar, so I will break 15 minutes into the webinar and take some questions on a certain aspect of that webinar. Omar: Like we’ve covered 15 minutes of this topic, any questions, pop them in, and I answer questions, and then some people they have just a burning question, like do you have a paying plan, or like does this integrate with this, they just want to know something and they have just been waiting the whole webinar, and they don’t want to wait to the end to figure it out, they are ready to buy, and sometimes they just give up, and then they will show up to the next webinar, and maybe their question will be answered then, so that’s a technique that has helped me. Steve: Okay, and then in terms of the post webinar follow up sequences, what are some things that you do with that? Omar: Well I do a limited replay, so I only offer for 48 hours. I do give the offer, and allow the offer to stand for the 48 hours, but I also give a bonus for those who are on the webinar, so if you buy live on the webinar or during the webinar, you will get something extra, you will get something that is of value that comes along with the purchase, but that bonus wouldn’t come if you bought after the webinar, but the discount or the promo will still stand for 48 hours. And then if they did attend, we say, “Hey thanks for attending, this is the offer,” and just remind them again that this is the offer that you have. You know it’s funny that even though we send a few emails, we send about 3 emails after the webinar, we still get people that ask for the offer when it expires, so like the day after it expires. You never can over communicate a lot, like wow 3 emails after the webinar, yeah, but some people literally just don’t open their emails on the weekends, they are busy, that’s normal. Steve: That’s interesting, so just through doing webinars and Facebook ads, you have managed to grow WebinarNinja to thousands and thousands of members overtime. Has there been like one thing that has catapulted the number of users for WebinarNinja? Omar: I have to say that we create a lot of content, like I can’t ignore that Steve, like I do a lot of guest posting, I do a lot of writing, and I have a daily podcast. I have over 740 episodes on the $100 MBA show, so like I’m constantly trying to build new relationships with new people in terms of that podcast, and try to get more listeners. It helps us a lot to have that consistent content going out, you know trying to build that rapport. I probably would say that’s the strongest thing. Most of people that show up to my webinars, heard of me in some way other than just off an ad. The ads work, but I think they click on the ad because they know who I am. Steve: Okay, that makes sense, so it’s just you have just leveraged your presence so to speak, and your name, in helping to build up WebinarNinja overtime? Omar: Yeah, growing their audience, yeah. Steve: Okay, cool, well hey where can people find you if they want to learn how to put together a good webinar? Omar: We have a course like I mentioned called the ultimate webinar course, and they can find that at webinarninja.co/course. If they sign up for that course, they have access to over 14 videos, it’s a 7 day course, there are some audio lessons as well. We have some cheat sheets that people love. They are really well done PDFs, they are downloads, and they’re just these great sheets that you can have handy on your own webinars, so remind you of what to do and things like that. And then if you are on our list, then you will be invited to the next webinar that we do, so you can definitely ask questions live on live webinars. Steve: One thing I also wanted to ask you was you have a conference too on webinars once a year? Omar: Yeah we ran WebinarNinja live which was a really, really fun conference that we ran. It’s just been a fun journey, because I’m trying to help people out in this weird world of webinars, and the small world of webinars, and it has been like a really fun journey, and one of the things I loved about the conference is just meeting the people that I have seen on webinars, meeting people that do webinars that are really good at it, and learning from them, people like [inaudible 00:48:55], people like John and Kay from Entrepreneur on Fire, John Cochran. These people have done some tremendous work with webinars, and it’s just been fantastic together, and just get to know them in person. There is something about the live experience that’s so impressive. Steve: Yeah totally. Cool man, well hey if anyone has any questions for you personally, what’s the best way to reach you? Omar: Twitter, my handle is @TheOmarZenhom on Twitter. That’s the best way to contact me; I’m pretty good at that in replying. Steve: Cool man, hey well thanks for coming onto the show Omar, I really appreciate your time. Hope you enjoyed that episode. Now if you follow my blog, you already know that webinars have had a huge effect on my businesses, and in fact the first time I gave a webinar, I made $60,000 in 90 minutes, yes it is that crazy. For more information about this episode, go to mywifequitherjob.com/episode140. Once again I want to thank sitelock.com for sponsoring this episode. If you have an e-commerce store, go there right now, and find out how long it takes to load. Does it take more than five seconds? If so did you know that 60% of consumers only wait up to five seconds before bouncing from a site, never making a purchase? And did you know that at least 68% of shoppers do not return to a poorly performing website. These are huge percentages, and they mean lost revenue and reputation damage for your business. Now with SiteLock TrueSpeed, a state of the art global content delivery network, they can improve your website speed by 50% on average, and reduce your bandwidth usage by 40% to 70%. For more details on how you can speed up your website, go to sitelock.com/mywifequitherjob, and get your first three months free. Once again that’s sitelock.com/mywifequitherjob.